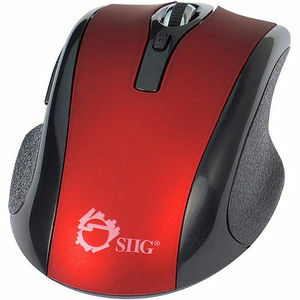 SIIG's 6-Button Ergonomic Wireless Optical Mouse - Red is designed to provide more advanced navigating functions with great wireless convenience. This optical mouse is equipped with six buttons to enable smooth browsing experience. Featuring Next/Previous control buttons offer easy web browsing or photo viewing. Dual level switchable DPI control allows quick cursor adjustment, work great on different applications and games. This ergonomic mouse is plug-and-play with no drivers to install. Simply plug in the wireless receiver to an available USB port and begin to enjoy a smooth and precise cursor performance without the hassle of tangled wire.